At the start of the 20th Century record companies controlled recording and sales by owning technology patents. With recordings of their work performers reached beyond theatre and music hall to a new mass market. This made record labels central to mainstream music, and they dominated the music business through manufacturing, distribution and retail. After World War Two they gave up their monopoly in recording technology and their last home-grown formats (78s and vinyl) became standard recording media which opened the door to independent record labels. As recording technology became available to their competitors they based their business on popular artists and popular songs. A&R men (Artists and Repertoire) working for record companies matched artists with repertoire from music publishers. Eventually record companies outsourced recording technology entirely. Now, record companies still dominate the music industry but they are simply a service supplier to the artist, among many others. In 2010 CNN Money reported Forrester Research using RIAA figures in an article titled Music’s Lost Decade. The combined impact of the Internet, the big labels’ slow response, the availability of single tracks instead of albums, more access to music listening online and unlicensed copying have put a 50% dent in music sales. The big labels also seem less able to find artists with broad appeal. In spite of this Billboard reported that in 2010 albums still account for three quarters of music sales and NPD Group reported that in 2009 CDs still represented 65% to downloads’ 35% with a break even point between the formats anticipated by 2011. This year (2010) recording master rights for the big hits of the 1960s started to expire and the sun began to set on the golden age of the record industry—income generated and rights to exclusive use. Big record companies, who sponsor far fewer big name artists these days, must re-invent themselves again. In a 2010 report Investing In Music Alison Wenham (AIM) seeks to rebrand record companies as “music companies”, her attempt to drop the word “record” is significant. But there are already many specialist music companies (publishing, production, management, merchandising, promotion, retail, events) and as the big record companies decline they have less claim to any particular expertise or resources. Record companies originally made and sold recordings—today their business is based on recording copyrights. They are no longer in the business of making records themselves. The role of record companies today is discussed in Get signed, get singed. We normally expect to see CDs or downloads on the label that signed the artist but it isn’t always that simple. Record labels frequently grant exclusive or non-exclusive licenses to other labels in their own territory or other territories. This means an artist signed by one label can appear on another. An artist on a Major label in one territory might even appear on an independent label elsewhere. A record company is a business which deals in recordings (e.g. EMI). A record label is a unit within the company which handles a particular catalogue or repertoire (e.g. Blue Note). A label can specialise in a genre or country, or sometimes just the project of a particular label head. A single record company can run many labels. In practice the terms record company, label and imprint are often used loosely to mean the same thing. Record labels fall roughly into two groups: the Majors and independent labels. These figures don’t change much from year to year. Record sales figures usually come from the RIAA (USA), BPI (UK), OCC (UK) or IFPI (a global body representing record companies). These numbers often exclude DIY and indie releases which bypass mainstream distribution and retail channels (e.g. CDs sold at gigs or from unsigned artist web sites). Record label earnings are described in Music royalties and licenses and Royalty collection societies. Major record labels have the largest catalogues of recording rights through historical mergers and acquisition with independent labels. Most of them have publishing companies and all control distribution and new media interests. The Majors make less than 1 in 5 of all controlled releases, and sell less than 70% of recorded music worldwide. The rest is sold by the independents. Within each Major record company, label groups and imprint names are frequently reorganised. Brands are mothballed, old names resurrected and labels re-grouped, so this table doesn’t show up-to-date company structure or a complete list of imprints. As the number of Majors gets smaller the number of imprints they control is increasing and they will buy and buy into more indie labels. Citigroup sold EMI recording (bought from Terra Firma) to Universal Music Group in 2011—the US FTC is considering the sale and papers were submitted to the EU in February 2012. Sony bought the other half of Sony BMG from partner Bertelsmann for $900 million on 5 August 2008. The Sony BMG joint venture was initially cleared by the EU in July 2004. It was reviewed and finally cleared in October 2007. EMI and WMG each made a bid for the other in 2006. EMI was then subject of an unsuccessful buy-out by Permira, followed by a successful buyout by Terra Firma in August 2007 for £2.4 billion. In 2010 WMG is currently up for sale and Terra Firma surrendered EMI to Citigroup. The Major labels no longer manufacture CDs in-house. Time/Warner sold their CD manufacturing to Cinram in 2004. EMI/Warner sold their Australian manufacturing to Summit in 2004. Universal sold their USA and EU manufacturing to Gleanayre in 2005. Sony manufacturing (DADC) was always separate to Sony Music. EMI retains manufacturing in Canada, and in Japan with Toshiba. Major record company earnings break down differently depending on their market activities. Each one has different interests. Here’s the BMG picture spanning the start of their joint venture with Sony Music Group in 2004. Independents rarely include publishing or manufacturing. They occasionally run distribution and frequently have new media operations. 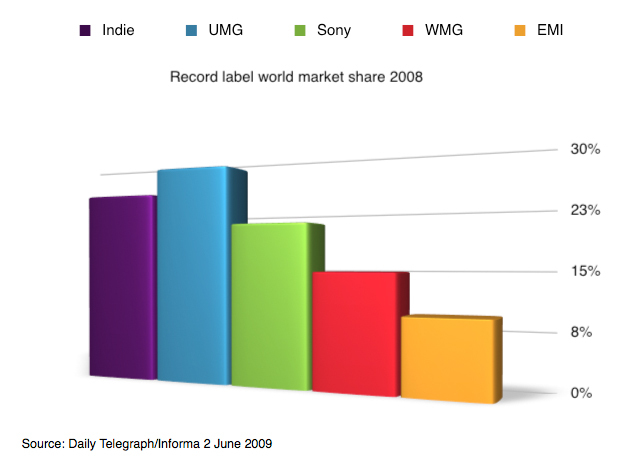 The indies make 4 out of 5 controlled releases, and sell over 30% of recorded music worldwide. There are several thousand independents in the UK alone—they are simply record labels that don’t qualify to be called Majors. 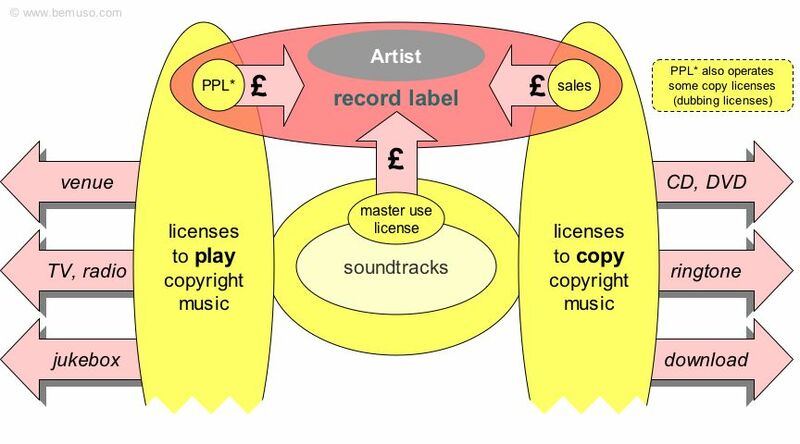 Some indies specialise in licensing existing recordings but most deal with their own content and artists. The bigger indies normally use Major label distribution, and Majors sometimes own shares or invest in indies. About 800 indies make up the membership of AIM (founded in 1998). There are examples of independent record labels in DIY. 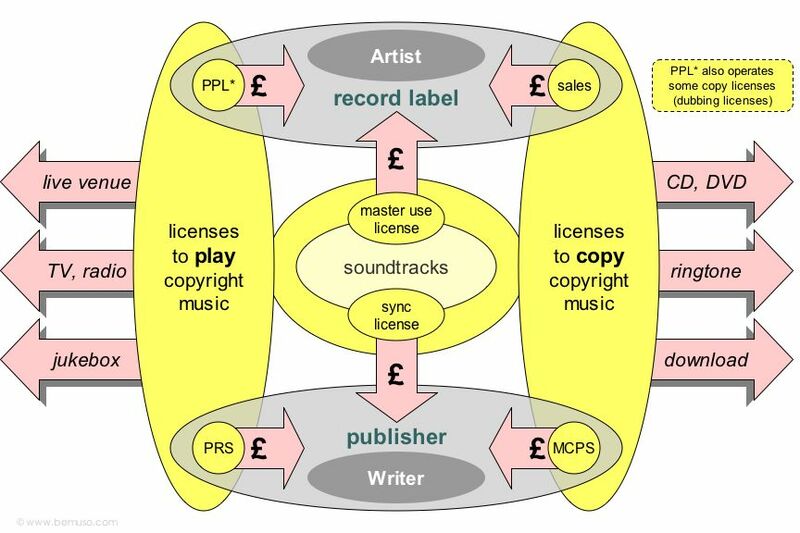 Music industry trade organisations and other professional bodies represent and work for record labels. About 400 Majors and large indies make up the membership of the British Phonographic Industry, BPI (founded 1973). The two main UK record label trade organisations are the BPI representing the Major labels and AIM representing independents. Both are represented outside the UK by IFPI the international record industry trade body. In Europe AIM are represented by Impala, and worldwide by WIN and their licensing body Merlin. The BPI are the main sponsors of the OCC, PPL and VPL although these organisations are also used by AIM members and members of neither. There is a retail trade affiliation between the OCC and ERA (which used to be called BARD), and a performance affiliation between PPL, Equity, the MPG and MU called the Joint Performers Organisation (JPO). UK Music—the replacement for British Music Rights (BMR)—now represents many of these organisations alongside publishing bodies and the MMF.